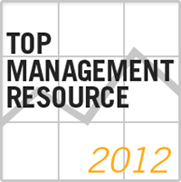 One of the assumptions of managerial practice is that organisational knowledge is based on valid data. Of course, knowledge is more than just data. 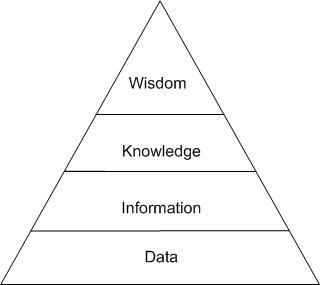 The steps from data to knowledge and beyond are described in the much used (and misused) data-information-knowledge-wisdom (DIKW) hierarchy. The model organises the aforementioned elements in a “knowledge pyramid” as shown in Figure 1. The basic idea is that data, when organised in a way that makes contextual sense, equates to information which, when understood and assimilated, leads to knowledge which then, finally, after much cogitation and reflection, may lead to wisdom. 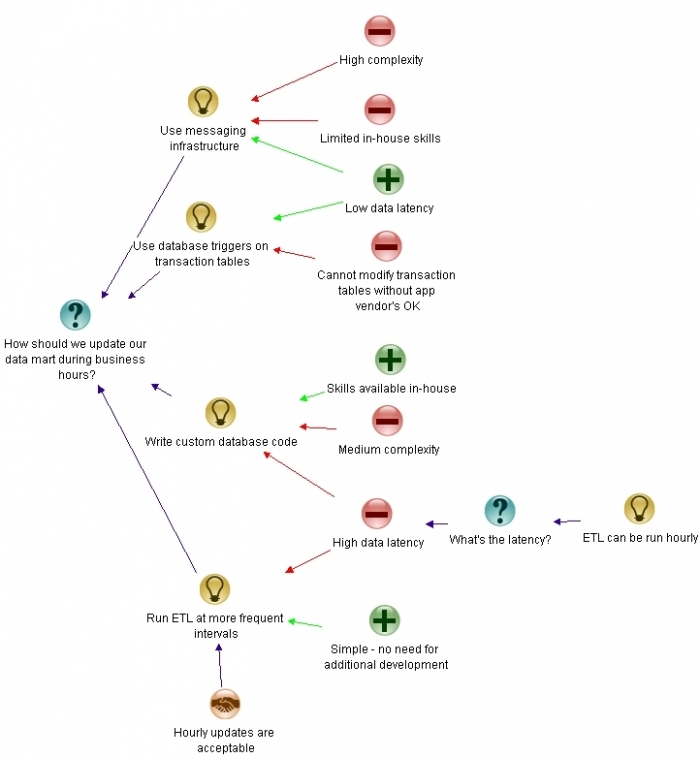 In this post, I explore “evil twins” of the DIKW framework: hierarchical models of non-knowledge. My discussion is based on a paper by Jay Bernstein, with some extrapolations of my own. 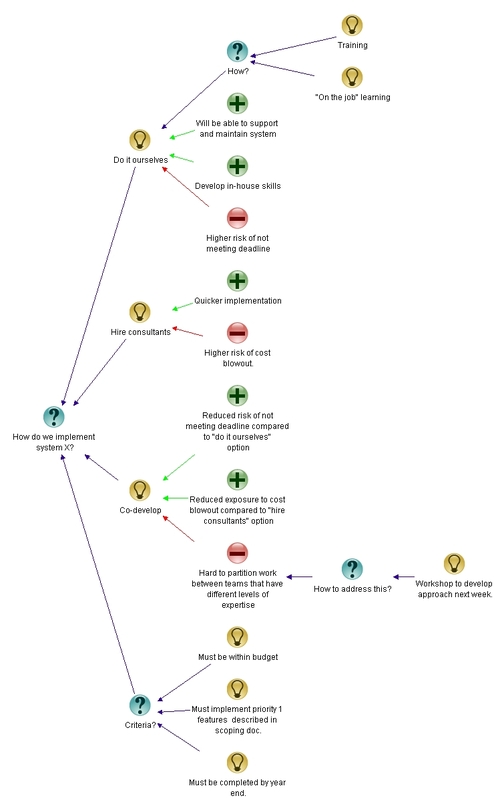 My aim is to illustrate (in a not-so-serious way) that there are many more managerial pathways to ignorance and folly than there are to knowledge and wisdom. Looking at the way DIKW decomposes a sequence of levels surrounding knowledge invites us to wonder if an analogous sequence of stages surrounds ignorance, and where associated phenomena like credulity and misinformation fit. This is not an exhaustive list of antonyms – only a few terms that make sense in the context of an “evil twin” of DIKW are listed. It should also be noted that I have added some antonyms that Bernstein does not mention. In the remainder of this post, I will focus on discussing the possible relationships between these terms that are opposites of those that appear in the DIKW model. The first thing to note is that there is generally more than one antonym for each element of the DIKW hierarchy. Further, every antonym has a different meaning from others. For example – the absence of data is different from incorrect data which in turn is different from a deliberate falsehood. This is no surprise – it is simply a manifestation of the principle that there are many more ways to get things wrong than there are to get them right. Disinformation – information that is deliberately manipulated to mislead. Unawareness – the state of not being fully cognisant of the facts. Ignorance – a lack of knowledge. Folly – foolishness, lack of understanding or sense. The meanings of the other words in the table are clear enough and need no elaboration. 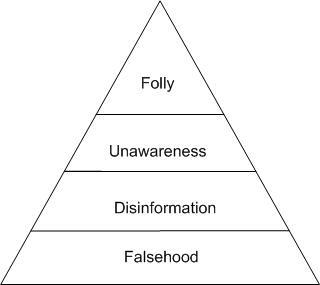 Meanings clarified, we can now look at the some of the “pyramids of folly” that can be constructed from the opposites listed in the table. Let’s start with incorrect data. 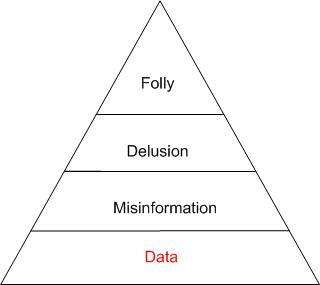 Data that is incorrect will mislead, hence resulting in misinformation. 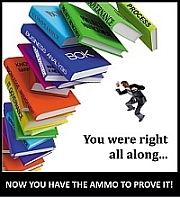 Misinformed people end up with false beliefs – i.e. they are deluded. These beliefs can cause them to make foolish decisions that betray a lack of understanding or sense. 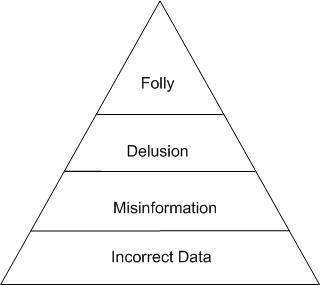 This gives us the pyramid of delusion shown in Figure 2. 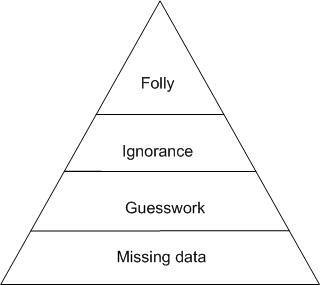 Similarly, Figure 3 shows a pyramid of unawareness that arises from falsehoods and Figure 4, a pyramid of ignorance that results from missing data. There’s more though – one can get things wrong at higher level independent of whether or not the lower levels are done right. For example, one can draw the wrong conclusions from (correct) data. This would result in the pyramid shown in Figure 5. Finally, I should mention that it’s even worse: since we are talking about non-knowledge, anything goes. Folly needs no effort whatsoever, it can be achieved without any data, information or knowledge (or their opposites). Indeed, one can play endlessly with antonyms and near-antonyms of the DIKW terms (including those not listed here) and come up with a plethora of pyramids, each denoting a possible pathway to folly.